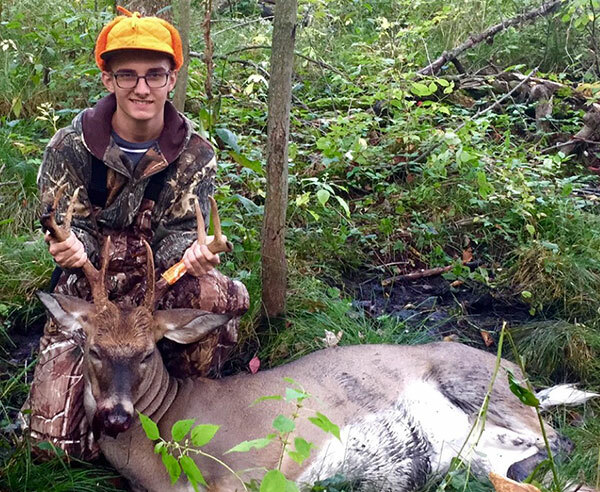 Derek Rose, age 16, the son of Pete and Cherri Rose, of Solon Township, got his first buck ever during last weekend’s youth hunt. He got the 8-point buck on Sunday, September 20, while hunting on private land, in Kent County, with his dad, Pete. The deer weighed in at 160 lbs. after being dressed out. Congratulations, Derek! Targeting walleye in the fall can offer some of the best fishing of the season. Here are a few things to keep in mind if you target this sport fish in the coming weeks. As the day goes by, start heading deeper, as walleye can be photosensitive. Don’t forget to try your luck during the nighttime hours. This can be a very productive time during the fall, especially along rock points and flat areas. Posted on 24 September 2015. 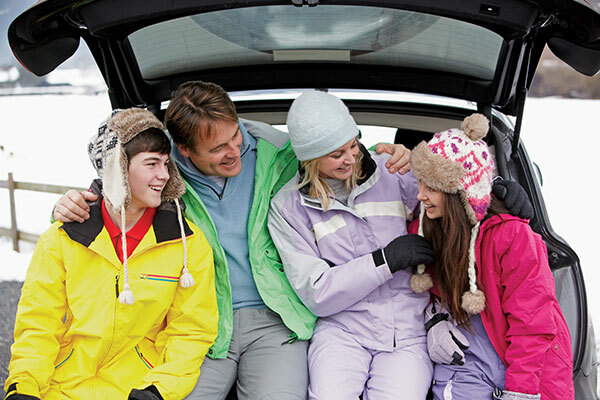 (Family Features) Conducting routine maintenance on your vehicle is necessary to maintain optimal performance and prevent costly repairs. As colder weather approaches, and with it the potential for treacherous road conditions, giving certain areas of your car special attention can also protect your safety. “Getting your vehicle ready for winter while temperatures are still mild is a proactive approach to preventive maintenance that helps ensure safety and reliability when severe winter weather strikes,” said Rich White, executive director, Car Care Council. The following tips will help you learn how to care for the systems and features most likely to affect your safety as winter approaches. Learn about the benefits of regular vehicle care, maintenance and repair, and order a free copy of the council’s Car Care Guide, at www.carcare.org. The brake system is a car’s most important safety system. A faulty brake system may impede your ability to safely slow your vehicle in inclement driving conditions or avoid an accident. Brakes sustain normal wear and eventually need to be replaced for both performance and safety reasons. Ignoring routine maintenance and letting brake pads wear too thin can lead to costly rotor and drum replacement, in addition to compromising your ability to execute a sudden stop safely. Have your complete brake system thoroughly inspected annually and replace equipment as needed. If your car is pulling to the left or right, or if you hear odd noises when you apply the brakes, you should have your brakes inspected. Other warning signs include an illuminated brake warning light, brake grabbing, low pedal feel, vibration, hard pedal feel and squealing. Don’t overlook the parking brake, which also may require adjustment or replacement parts. When roads become wet or icy, the right wheels and tires can help ensure you have the traction you need to maintain control. Maintaining tire balance and wheel alignment reduces tire wear and improves handling and fuel economy. Tire replacement is necessary if the tread depth is below the minimum legal requirement, or if the sidewalls are severely cracked or punctured. In addition, normal wear and road conditions can take their toll on your car’s steering and suspension system and disrupt the alignment, which in turn reduces optimum handling. Use the “penny test” to check your tread; if you see Lincoln’s head above the tread, you are ready for new tires. Have your car’s alignment checked at least annually or at the first sign of improper handling or uneven wear. Check inflation pressure at least once a month (including the spare) and once per week in the winter. Rotate and balance tires every 6,000 miles to avoid accelerated wear on shock absorbers and struts. Your battery should be securely mounted, with connections clean, tight and corrosion-free. If the battery is three years old or more, it should be tested and replaced if necessary. Headlights play a major role in safe driving; the chances for accidents increase if you can’t see or be seen. The lighting system provides nighttime visibility, signals and alerts other drivers, and supplies light for viewing instruments and the vehicle’s interior. If there is any doubt about whether or not your headlights should be on, turn them on. Keep headlights, tail lights and signal lights clean. External dirt and debris can dim operational lights, making it difficult to be seen by others. Make sure your headlights are properly aimed. If they aren’t, headlights blind other drivers and reduce your ability to see the road. Don’t overdrive your headlights. You should be able to stop inside the illuminated area; otherwise you are creating a blind crash area in front of your vehicle. Replace dimming, rapidly blinking or non-functioning lights immediately, but check first to ensure a loose or faulty fuse isn’t the source of the problem. The wiper system keeps excessive water, snow and dirt from building up on the windshield, maintaining clear visibility. Many factors can accelerate the replacement of wipers, including operating conditions, frequency of use, material and type of wipers and weather. In general, replace blades every six months or when cracked, cut, torn, streaking or chattering. Be aware that some vehicles have two washer fluid reservoirs. Check levels monthly and use washer fluid only; do not use water. 1. Check all fluids, including engine oil, power steering, brake and transmission, as well as windshield washer solvent and antifreeze/coolant. 2. Check the hoses and belts for signs of damage or wear. 3. Check the battery and replace if necessary. 4. Check the brake system annually and have the brake linings, rotors and drums inspected at each oil change. 5. 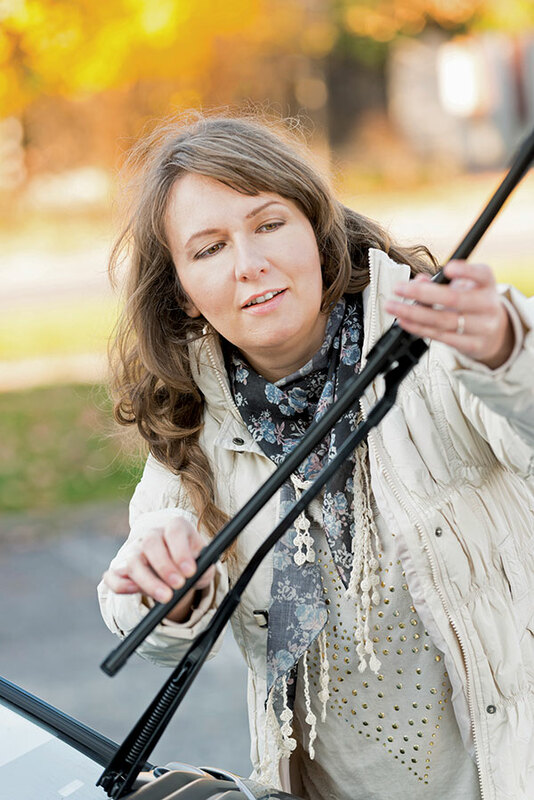 Inspect the exhaust system for leaks, damage and broken supports or hangers if there is an unusual noise. 6. Check the heating, ventilating and air conditioning system, as proper heating and cooling performance is critical for interior comfort and for safety reasons such as defrosting. 7. Inspect the steering and suspension system annually, including shock absorbers, struts and chassis parts such as ball joints, tie rod ends and other related components. 8. Check the tires, including tire pressure and tread. Uneven wear indicates a need for wheel alignment. Tires should also be checked for bulges and bald spots. 9. Check the wipers and lighting, including both interior and exterior lighting, and replace worn wiper blades so you can see clearly when driving during precipitation. The Apostle Paul wrote, “I can do all things through Christ who gives me strength” (Philippians 4:13). There’s no way he could have anticipated how those words would later be used. Printed on bumper stickers for aspiring marathoners; a benediction for victors of a football game; inscribed on the shirt of a middle-aged man attempting to reclaim his lost youth in the weight room. I don’t think this is what Paul had in mind. The Apostle was talking about contentment, not accomplishment, borrowing an idea from the Greek Stoics. The only way one could be happy, per Stoic thought, was to rely upon nothing and no one. This was Stoicism’s highest ideal, and you have to admit that they were on to something. If you didn’t need someone else’s money, protection, or affection, if you could be free of all fear, expectations, and emotional hostage-holding, you would be truly liberated. No, this isn’t about overcoming, but accepting. It’s not a call to Stoic-like effort, rather, it is positioning one’s self to receive the strength that Christ offers. Contentment is not the result of trying harder, no matter what the Stoics or iron-pumping athletes might say. It is the result of relying upon a Power greater than yourself. This is why Paul’s words are often so grotesquely misappropriated. They are used as a form of defiance against the odds, used to magically conjure up our personal strength when we have none left, making us try harder, go farther, endure longer, and never surrender until we are victorious. This is the exact opposite of what Paul was saying. It is only in surrender, the surrender of our own power, that the power of Christ can be ours. Tireless self-sufficiency will take you far in life, but to be genuinely content, and genuinely powerful, it won’t take more but less—less of yourself and more of Jesus. Harold and Karen (Homrich) Stoner, of Cedar Springs, are celebrating their 50th wedding anniversary. 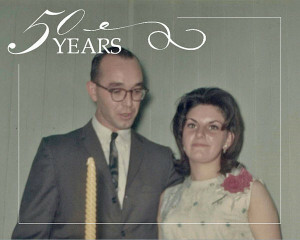 They were married on September 24, 1965. They met while working at Keeler Brass in Grand Rapids. Harold retired from General Motors in 1999 and focused his efforts on fishing, golfing, and hunting the elusive mushroom. Karen loved being a stay-at-home mom but redirected her attention to the home’s beautiful landscaping, golfing and Angry Birds. They enjoy spending time with their two lovely children, their families and babysitting the grandpets. A celebration with family & friends is planned in their honor. Arthur Cazier age 81, of Grant, passed away September 18, 2015 at Spectrum Health Butterworth Campus. He was born January 17, 1934 in Grand Rapids the son of Cecil and Myrtle (Elliott) Cazier. During his working years he worked at McInerny Spring and Wire for 38 Years before retiring from there. He loved fishing, hunting and playing his harmonica which Art played at many locations. Surviving is his sister, Bessie Smith of Marne. He was preceded in death by his wife Dorothy in 2011, and five brothers, Russ, Rex, Glen, Wes, and Jerry; and two sisters, Doris and Iva. 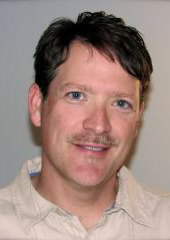 Memorial services will take place on October 14 at the Cedar Springs American Legion Post from Noon till 4 pm. Alice M. Kelly, 84 of Lake City, went to be with her Lord and Savior on Tuesday, September 22, 2015 at Belle Oakes Living Center. Alice was born June 10, 1931 in Gladwin, Michigan, the daughter of Reynold and Martha (Koenke) Kranich. She enjoyed writing and journaling and wrote many letters to missionaries over the years. Surviving are her husband, Gerald whom she married on July 25, 1959; sons, Craig (Finley), Dale, Ken (Heather); sisters, Flora (Floyd) Helling, Clara Maddox, Charlene VanWyk; brother, Norris (Marjorie) Kranich; sister-in-law, Marilyn Kelly; many nieces and nephews. The family will greet friends Friday from 10:00 am until time of service at 11:00 am at Calvary Baptist Church, Lake City. Pastor Brian Algie officiating. Interment Sherman Mesick Cemetery. A doctor buys a brand new Ferrari GTO that costs him $500,000. He takes it out for a spin and stops at a red light. “Because this car can do up to 250 miles an hour!” states the doctor proudly. WHHHOOOOOOSSSSSHHH! Something whips by him going much faster! “What on earth could be going faster than my Ferrari?” the doctor asks himself. He floors the accelerator and takes the Ferrari up to 175 mph. Then, up ahead of him, he sees that it’s the old man on the Moped! Amazed that the Moped could pass his Ferrari, he gives it more gas and passes the moped at 210 mph. He was feeling pretty good until he looks in his mirror and sees the old man gaining on him AGAIN! Astounded by the speed of this old guy, he floors the gas pedal and takes the Ferrari all the way up to 250 mph. Not ten seconds later, he sees the Moped bearing down on him again! The Ferrari is flat out, and there’s nothing he can do! Sept. 29: The Cedar Springs Library is holding a Beginning Excel Computer Class for FREE on Tues., September 29 at 11 am. Please RSVP by calling 616-696-1910. 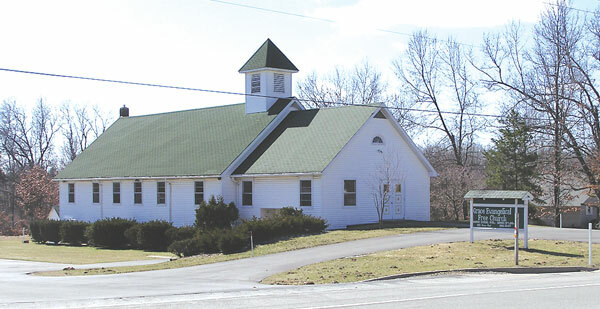 The Cedar Springs Library is located at 43 W. Cherry St., Cedar Springs. Oct.6: The Literacy Center of West Michigan has scheduled and information session on Tuesday October 6th at 2 pm for prospective volunteer tutors. Persons interested in becoming volunteer tutors can find out more about the Center and its literacy programs. There will be an opportunity to sign up for tutor training. By training people to be tutors, the Center can offer one-on-one reading help to adults asking for assistance in reading or English as a Second Language (ESL). You do not need to speak another language. The Center is located at 1120 Monroe Ave., NW, Suite 240, Grand Rapids. Please call 616-459-5151 (ext. 10) or email us at info@literacycenterwm.org to register.